Allergy is the sixth leading cause of chronic illness in the United States. More than fifty million Americans suffer from allergies and they spend an estimated $18 billion coping with the disease. Yet despite advances in biomedicine and enormous investment in research over the last fifty years, the burden of allergic disease, which disproportionately affects children, the poor, and people of color, continues to grow. Why have we failed to reverse this trend? 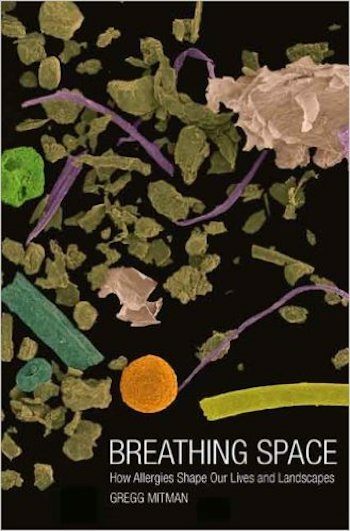 Breathing Space offers an intimate portrait of how allergic disease has shaped American culture, landscape, and life. Drawing on environmental, medical, and cultural history and the life stories of people, plants, and insects, Mitman traces how America’s changing environment from the late 1800s to the present day has led to the epidemic growth of allergic disease. Despite the quest for a magic bullet, none of the hoped-for solutions has succeeded. By steadfastly ignoring the relations between environment and disease, we have inadvertently helped to create America’s allergic landscape. Hay fever got you down? Feel an asthma attack coming on? Drop the inhaler and reach for Gregg Mitman’s book instead. His inspired history of these ailments in the United States won’t provide a cure but does offer a sort of palliative context.